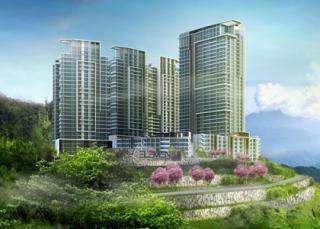 Elemen is an exclusive development comprising six blocks of serviced apartments in the Genting Highlands of Malaysia, an hour from Kuala Lumpur and 6,000 feet above sea level. It infuses the five elements of Feng Shui: fire, earth, water, metal and wood and when completed will be the highest resort in Asia. Because the Developers of Genting are offering warranties on the apartments twice the normal average in Malaysia, they were careful to choose a waterproofing material that would meet this requirement. Accordingly, they chose Radmyx capillary waterproofing for their basement waterproofing as Radmyx will continue to waterproof the basements for the life of the structure.